Divers recovered the black boxes from the wreckage of an airliner in Benin on Saturday as investigators puzzled over why the Beirut-bound Boeing smashed into the sea moments after take-off. Nine more bodies were pulled from the surf on Saturday, taking the death toll from Thursday's disaster to near 140, while 15 survivors were met after touching down in Lebanon. The Boeing 727 was carrying 151 passengers plus crew, including over a hundred Lebanese nationals, 15 Bangladeshi army officers returning from U.N. peacekeeping duty in Sierra Leone and Liberia, and people from many African nations. 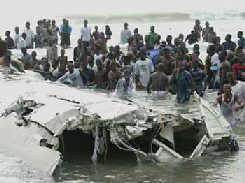 A team of divers found the black boxes underwater in the plane's tail section. The two orange-colored devices should have recorded cockpit conversations prior to the crash and any anomalies in the functioning of the aircraft. Grieving relatives, Lebanese officials and national investigators want to find out if the plane had a technical hitch or plowed into a building during take-off because it was overloaded. At Beirut airport, relatives torn between relief and sadness, met 15 survivors, whisked home in a Lebanese government plane which had raced help to the tiny West African country. "We don't know whether to be happy or sad. Those who died were all our children," said a relative of survivor Khodor Farhat. "Even Khodor's return is not what we wanted. He is back on a stretcher." The Lebanese have thriving, long-standing communities in West Africa and many of those on the plane were flying to see families in poor villages in the south of the country. Ambulances took the 12 Lebanese survivors, one Syrian and two Palestinians to hospital on arrival at Beirut airport. At least one of the Lebanese was in a critical condition. TOO MANY PEOPLE ON BOARD? A French plane carrying 140 coffins arrived in Cotonou on Saturday to fly bodies home. Some 74 olive-green coffins were due to be flown to Beirut on Sunday after a midday ceremony on the airport tarmac in Benin. Two coffins were due to be taken to Paris. U.N. Secretary-General Kofi Annan expressed his condolences to the bereaved families of the 15 Bangladeshi officers killed and thanked the poor Asian country for its "outstanding contribution" to peacekeeping efforts. In Lebanon, Foreign Minister Jean Obeid said after returning from Benin that the plane appeared to have been overloaded with passengers and baggage and investigations were under way. "It seems from preliminary evidence that there was a surplus in the number of passengers and a surplus in the load. A big surplus," he said. "I don't know if there were problems before but the plane was unable to take off." Some survivors described feeling the plane was struggling to take off before it smashed into a building at the end of the runway and plunged into the shallow coastal waters. Airport officials in Benin said the plane had trouble retracting its undercarriage but did not rule out that the Guinean-registered aircraft may have been overloaded. "It's plausible," said one, adding that the inquiry would take some time to piece together all the evidence. Guinea's Transport Minister Cellou Dalein Diallo said the plane was first used by the Guinean-registered company Union des Transporteurs Africains (UTA) in September this year. It had previously been used by American Airlines and Afghan Airlines. Benin has not allowed the Libyan co-pilot, who survived the crash, to leave as they want him to help with their inquiries.